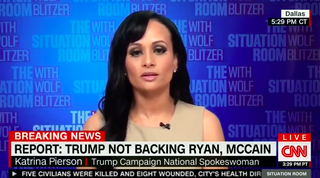 Between Donald Trump and Katrina Pierson, I don't know who needs the biggest muzzle. Or, at least, a lesson in history and timelines. In an interview with CNN's Wolf Blitzer, Pierson, the Republican presidential nominee's spokesperson, spoke about Trump apologizing … I mean, honoring … Humayun Khan's death while defending Trump's attacks against the deceased soldier's family. Pierson then went and gave history a little makeover. "It was under Barack Obama and Hillary Clinton that changed the rules of engagement that probably cost [Khan's] life," she said (2:04 mark). Well, how could that be, when Khan was killed in Iraq in 2004 and Obama did not become president until 2009? Pierson once again proved that she's the perfect Trump spokesperson, since it appears they're sharing the same brain.